Use a sunscreen with at least an SPF (Sun Protection Factor) of 15 or higher on all exposed areas of the body, even on cloudy days. Reapply every two hours and after swimming or perspiring. Wear a hat. Shading your face from direct sunlight will not only reduce your chances of sunburn, but could also provide wrinkle-protection! 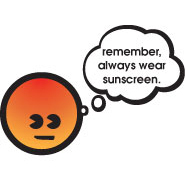 Avoid sunlamps or tanning spas. Although tanning is a protective reaction to exposure to UV light, it does not prevent skin cancer. I have not had to worry about this kind of exposure this summer but I know that some of you do - especially if you live near the beach or plan to vacation at one. Just consider this my summer public service announcement.. even if it is a month late. Good advice....just bought a cute straw hat at the thrift store...so I'm all set!!!! I agree with Wanda...Great advice! I have been in the sun more this summer than last summer and the summer before and am not through. We went to the water park the other day and I had on SPF 70. It didn't block all of the sun. I still got sun. We were there for 3 hours. The UV rays were so intense! A year and a half ago I did the tanning beds for about 5 months, 3 times a week. It so damaged my skin. I think that I aged 5 years by doing that. I loved going because it was so relaxing, but it is so not worth the risk.